The housing market has fluctuated pretty significantly in the past 15 years. A primary goal is usually to buy a home and sell it for more when the current market value goes up. If you are starting to default on your mortgage during an real estate upswing, you should be able to sell the home for more than what you owe on it. You are debt free and probably have money left over from the sale. What happens during a market downturn? When the lender agrees to let the borrower sell the home for less than what they owe it is called a short sale. A deed in lieu of foreclosure is when borrower deeds the home to the lender in exchange for them not foreclosing and voiding the mortgage. The lender may decide to go after the borrower for the difference if the home is sold for less than what was owed. Deed in Lieu of Foreclosure Overview - Articles Coming Soon! 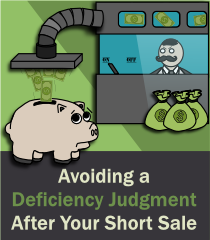 Section 5D: How do I Avoid a Deficiency Judgment when I do a Short Sale? Getting the bank to ensure that you will be forgiven of any leftover debt can take some serious convincing. This article contains an outline of the terms and agreements you may want the bank to sign and agree to. If you find a potential home buyer that makes an off to purchase the home for less than what you owe, you will need to first get the bank’s approval to release the lien.